From the time of the destruction of Jerusalem in 70 CE when the Roman Empire exiled the Jewish people, they longed for a future restoration to the land of Israel. The 16th century Protestant Reformation saw Christians reading of the Bible promises of a latter day restoration of the Jewish people to their ancient homeland. This awareness not only spread widely through the Church, but among political leadership in Britain, at the same time as her Empire was expanding in the East. The 19th century saw Britain, concerned for her links to India, Australia and New Zealand, being drawn into the affairs of the eastern Mediterranean and the land of Israel, coinciding with an awakening among the Jewish people for a restoration to their ancient homeland. The First World War, beginning with the Gallipoli campaign and political concern for the future of the Ottoman Empire, presented an opportunity for the restoration of Israel. On 31st October 1917, the same day as the British-ANZAC victory at Beersheba – including the charge of the Australian Light Horse – came the British War Cabinet”s decision to favour the establishment of a Jewish National Home in Palestine. General Allenby”s subsequent entrance into Jerusalem was the fulfilment of some three hundred years of geo-political activity and British Christian vision. 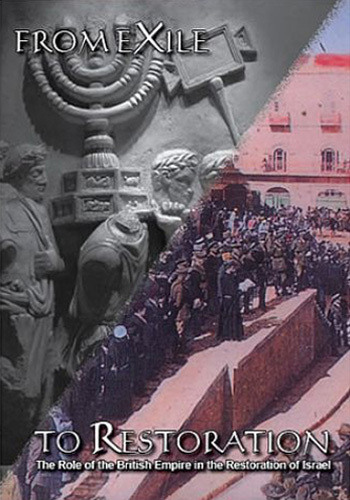 In From Exile to Restoration, Australian author Kelvin Crombie, together with Israeli academics, the grandson of a hero of the Beersheba “Charge”, and British and American churchmen, presents the story of these Jewish, Christian and geo-political factors which intertwined to lead to the modern restoration of Israel. As Cyrus, the King of the ancient Persian Empire first restored Israel after the exile to Babylon, so the British Empire became the modern day “Cyrus” to restore Israel after the second exile across the world. From Exile to Restoration is the sister film to The Destiny of Britain and prequel to The Forsaken Promise.